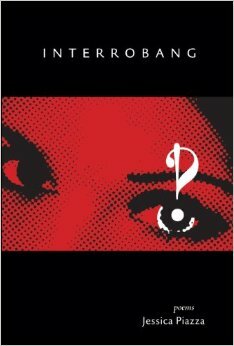 Click here to view my review of Interrobang. Jessica Piazza’s first full-length collection, Interrobang, was published by Red Hen Press in September 2013 and was the recipient of the AROHO 2011 To the Lighthouse Poetry Prize and the 2013 Balcones Poetry Prize. Poems in this collection appeared in such places as 42 Opus, Anti-, Indiana Review, The New Orleans Review, No Tell Motel, The Offending Adam and Rattle. In the following interview, I discuss with Jessica her thoughts on her personal writing habits, the process behind Interrobang, and what she is working on now. MLT: Hi Jessica! Thank you so much for taking the time for this interview! There have been a few questions that have been stirring around in my mind about craft and the realization of this book, ever since I first read Interrobang. JP: Hi McKenzie! Thanks for reading Interrobang and reviewing it in the first place. Happy to answer any questions you have. MLT: Just to jump right in, what type of environment do you need to write? JP: I worry less about my external environment than my internal environment. Meaning, I can write anywhere when I get the bug. The issue for me is finding a project to obsess about so I can really dig in! MLT: Who are some of your favorite writers? JP: Wow. The big question, right? Too big, maybe. As for poetry, I can say Millay, Eliot, Shakespeare. I can go contemporary and say Siken, Donnelly, Kalytiak Davis. I could name my startlingly talented friends: Essbaum, Lindenberg, Cantwell, Johnson, Rivkin, O’Neill, Todd and more. And I could go nuts naming fiction writers, too. But the truth is, my favorite writer is whichever writer I’m reading at the moment who is moving me. I have a terrible, horrible memory, and while I remember loving authors I have a really hard time remembering individual books and poems. So I’ve learned to really embrace the wonderful things I have in front of me at any given moment, and try to be inspired as often as possible. MLT: What was your inspiration for this collection—writers, places, events, songs, etc.? JP: My inspiration for Interrobang was my own issues with anxiety, first and foremost. The collection started with the phobias because I was exploring issues of fear and how far those fears dig into a person’s psyche and life. The philias angle came about organically when I realized how much love/lust and fear are connected. I wrote my first phobia poem after having a panic attack while trying to spelunk for the first time. Sigh. That wasn’t meant to be. As far as my form and language, I had a ton of inspirations. Gerard Manley Hopkins, for sure—in sound if not content. Through both her work and her friendship, Jill Alexander Essbaum taught me not to be afraid of being myself in my writing, even if that’s over the top. I usually don’t write to music, but PJ Harvey’s Stories from the city, stories from the sea definitely inspired me in this collection, too. MLT: How long did you work on this collection? JP: Hard question to answer, actually! I figured out the actual form I wanted the collection to take about six years ago, when I wrote the first poem that actually took a phobia as its title. (That was “Eremophpobia,” if anyone’s curious!) But some of the poems in here are revisions of poems originally written more than a decade ago. And some I wrote right before I started sending the book out. So it’s been a long haul! MLT: I have a small background in Psychology and so was extremely fascinated by the use of the Phobia and the Philia. How did you start that project? Did you write a few poems and realized there was a larger project to be had, or did you always know this was going to be a larger project? JP: As I said, my own anxiety was definitely a springboard. As soon as I started exploring lists of phobias and philias I knew I would be using them as inspiration somehow. However, when I started writing poems using those lists I figured the project would be a chapbook at most. I didn’t think I could sustain the conceit over a whole book, but boy was I wrong. I got deeper and deeper into it and I couldn’t make myself stop. I went back to old poems I wasn’t quite happy with and realized they were all coming from this similar place that fit exactly into the phobia/philia motif, and revised accordingly. It all just came together and became sort of behemoth. MLT: Another point of interest to me was the use of the sonnet form. Did these poems begin as sonnets, or did they evolve into the form? How did you decide to structure this collection (which is filled with contemporary, psychologically-driven ideas) with a more traditional design? JP: When I began writing the poems using the phobia/philia conceit, yes, those were sonnets. (As I said, some were later revised into sonnets when I knew they would work for the book.) But I find sonnets very soothing. In fact, it’s potentially annoying for me to say this but they come easily to me; far easier than free verse. I knew I was excited about this phobia and philia conceit and I knew that I had so much internal energy building about the project and so much to say in every piece. I really thought that the sonnet form would be perfect for this—it was a way to contain the vastness and vitality of the theme. A few of the poems truly didn’t feel like sonnets to me, though, so I searched for other forms that felt more approprioate. I have a tanka in there, for example, and a poem in terza rima and some Sapphic verse. And heresyphilia—love of radical deviation—is a prose poem for obvious reasons! MLT: I’ve always been fascinated by how writers order their poems, and their personal process in making those decisions. How did you order your poems, or decide on where to place the “non”-phobia-and-philia poems? JP: Ordering poems was a dilemma for me in this book. Well, except for the three mini sonnet crowns—I knew those would go in the beginning, middle and end of the book, and I knew their order because it felt like they created a little narrative: the woman in the fucked-up relationship, the woman trying to find herself and walk away and the woman who was learning to celebrate herself despite what others thought. I think those created a little mini-collection that spoke to, but was not directly part of, the phobia and philia project. It was the phobias and philias themselves that were hard to place because I don’t think they tell a story, but instead work as little snapshots into deeper and more complex (and ultimately not necessarily connected) lives. So I’ll be honest—I winged it. I tried to mix up poems in the two sections so each had some family-themed ones, some romantic relationship ones and some more general or contemplative poems, but all in all it was pretty random. Except the very first poem in the book, that is. “Melophobia: fear of music.” In a collection that relies so much on sound and voice, I felt like that had to come first. And the last phobia/philia poem, “Kakorrhaphiophobia: fear of failure,” ended the collection for a similar reason: very few of us leave a project satisfied that it will find its true place in the world. So I ended on that note. MLT: What are you working on now? Anything new we should be on the lookout for (publications, etc.)? What do some of your new poems focus on? How do you think your next collection might compare thematically to this one? JP: Thank you for asking, and yes! I have a chapbook available for order now from Black Lawrence Press called This is not a sky. It’s all ekphrastic poems that consider very famous paintings. I think some of the writing in there is my best work ever. They aren’t formal poems, either, though they use soundplay and the conventions of form in specific and, I think, explosive ways. Like Interrobang, This is not a sky has an obsessive edge, and it delves into desire and fear and death. (I can’t seem to get away from those in my work!) It’s available here. I also have a book of erasure poems coming out at some point with Red Hen Press called Obliterations. It’s co-written with Heather Aimee O’Neill, and we did side-by-side erasures of New York Times articles. It was a really fun project, and especially so because the results weren’t at all like the poems I write without the constraints of the erasure form. In the end, it was pretty amazing to see how one article can yield two such very different poems each time! MLT: Wow! These new projects sounds incredible! I know I’ll certainly be on the lookout for them. And thank you again, Jessica, for taking the time to discuss Interrobang. I can certainly say that I love this collection and can’t wait to see where these next projects take you. JESSICA PIAZZA is the author of two full-length poetry collections published by Red Hen Press: Interrobang (winner of the AROHO 2011 To the Lighthouse Poetry Prize and the 2013 Balcones Poetry Prize) and Obliterations (with Heather Aimee O’Neill, forthcoming), as well as This is not a sky (a chapbook from Black Lawrence Press). She holds a Ph.D. in English Literature and Creative Writing from the University of Southern California and is currently a contributing editor for The Offending Adam and a screener for the National Poetry Series. Her commitment to fostering writing communities wherever she lives led her to co-found Bat City Review in Austin, TX, Gold Line Press in Los Angeles, and Speakeasy Poetry Series in New York City. She currently teaches for the Writing Program at USC and the online MFA program at the University of Arkansas at Monticello. You can learn more at www.jessicapiazza.com.